Rabbi Joel Abraham, third from right, takes part in a press conference about the Nitzavim campaign in Raleigh, NC, with other rabbis and state NAACP leaders. Concerned that certain laws may imperil the rights of many blacks and Latinos to vote in the upcoming presidential election, a team of Reform rabbis is lending its efforts to make sure minority voters are not kept away from the ballot box in November. They call their campaign “Nitzavim,” a Hebrew word that means “standing firm.” The Nitzavim coalition currently involves the Religious Action Center of Reform Judaism, the National Association for the Advancement of Colored People, Lawyers’ Committee for Civil Rights Under Law, and PICO National Network, a coalition of faith groups that are banding together to protect voters’ rights. When the Voting Rights Act was passed in 1964, Congress prohibited state and local governments from imposing any law that results in voter discrimination against racial or language minorities. But in 2013 the United States Supreme Court struck down several key provisions of the law. Its ruling allowed individual states to write their own statutes on who may or may not cast a ballot. Since then, 17 states have written laws that abolish same-day voter registration and early voting and that require state ID cards for voters. Supporters of such restrictions say the laws are intended to reduce voter fraud, while opponents have charged that the statutes are aimed at suppressing votes in black and Latino communities, where the overwhelming number of voters align with the Democratic Party. 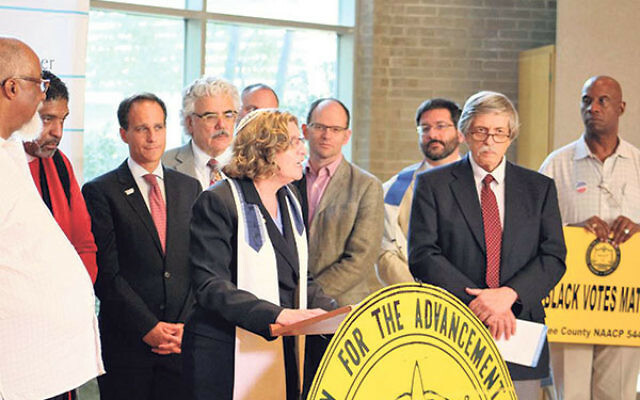 The clergy members began their voting rights drive in the Raleigh-Durham area of North Carolina on Aug. 18 to coincide with the start of Tu B’Av, the minor Jewish holiday. “We picked Tu B’Av because it is the Jewish holiday that celebrates love,” said Rabbi Joel Abraham of Temple Sholom in Scotch Plains. “As Rev. Dr. Martin Luther King Jr. taught, ‘Darkness cannot drive out darkness: Only light can do that. Hate cannot drive out hate: Only love can do that,’” said Abraham, who was one of more than 200 Reform Jewish activists from coast to coast, including Reform leaders the Union for Reform Judaism, Religious Action Center, Central Conference of American Rabbis, and Hebrew Union College, present at the start of the campaign in North Carolina. Abraham was the only rabbi from New Jersey. North Carolina was aptly chosen for the launch because a 2014 state law abolished early voting provisions and instituted ID card requirements. For three days the RAC delegation was joined by local Christian and Jewish clergy and lay activists to learn strategies for voter registration and poll-watching, and then put what they had learned into practice. “We scattered out all over the state and knocked on doors helping people register to vote,” said Abraham. Abraham said he was especially moved by the words and works of the Rev. William Barber, pastor of the Greenleaf Christian Church in the town of Goldsboro and president of the state NAACP. It was Barber who enlisted rabbis to join his efforts at protecting imperiled voting rights for people of color. Now that he is back home in Scotch Plains, Abraham is working to enlist his entire congregation in the effort he considers so vital. He said he presents the matter to his congregants — who hold a range of political beliefs — as a nonpartisan effort. “We’re a democracy. For democracy to work, everybody needs not only to be able to vote but to feel their votes are listened to, are valid,” he said. Abraham said there are a number of ways to support the effort. “The easiest way, the low-hanging fruit, is for us to be a 100 percent voting congregation. We make sure that everyone in our congregation is registered to vote and makes a pledge to vote. “We are also training people to register voters in our own area, and we can send people to register voters in 25 states where the NAACP says voting rights are under attack.” Volunteers can help people register or work phone banks to reach potential voters. One possible impediment Abraham sees to Jewish involvement in the campaign may be the hostile reaction of many Jews over the recent Black Lives Matter platform that includes a denunciation of Israel as “an apartheid state” that is committing “genocide” against the Palestinians. He said that such offers of help can be accompanied by statements acknowledging that the Black Lives Matters’ platform “is disturbing, but it is not going to interfere with how we care about you and how we care about what is going on” in regard to possible disenfranchisement. Anyone interested in participating in Nitzavim can receive more information at rac.org/nitzavim-pledge-take-action.